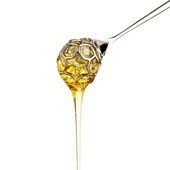 Honey is a natural delicacy produced in Italy in different types and varieties. Some articles about the disappearance of the bees and the essential role of the honey in our feeding are asking our attention. The design is inspired by shapes and structures existing in nature and by studies about the building of the spherical surface performed in the architecture and natural science fields. The use of the honey during the breakfast with hot milk and tea or as remedy for the sore throat are been a good suggestion. 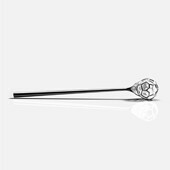 A beehive with two star shaped flowers on each end is founded on a cone-shaped stem, thus creating a steel whole object. 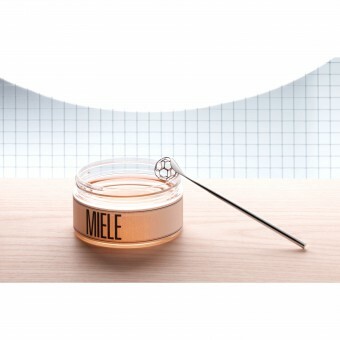 It is lightweight and its hollow interior is suitable for picking the desired quantity of honey from the jar, transfer and mix it into a cup containing drink. 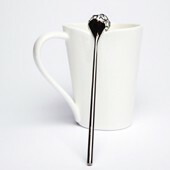 It can be used as a spoon, thanks to the small dimension of the sphere and the material of which it is produced. Acacia is a small dipper able to hold honey inside during the displacement from the jar to another point. The rounded section of the handle lets rotating the object between two fingers and prevent the inadvertent fall of a honey drop. It is not damaged in high temperature conditions. The project started in April 2012 in Milano and finished in April 2014 between Milano and Crusinallo. It was presented at Maison&Objet, Paris and Homi, Milan in Autumn 2014. The object is produced in two parts welded between them with the microcasting technology of the steel 18/10. It is composed of a sphere formed by the honeycomb structure joined to a dipper that makes it easy to serve and spread the honey. 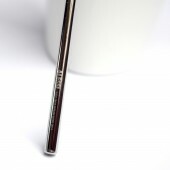 The mirror-polished finishing completes the process of production. Hight mm 160 Diameter mm 25 The spherical part can hold about grams 8 of honey. Geometrical and natural forms. Design and production quality, aestethic values to represent something precious, able to play as a gift. 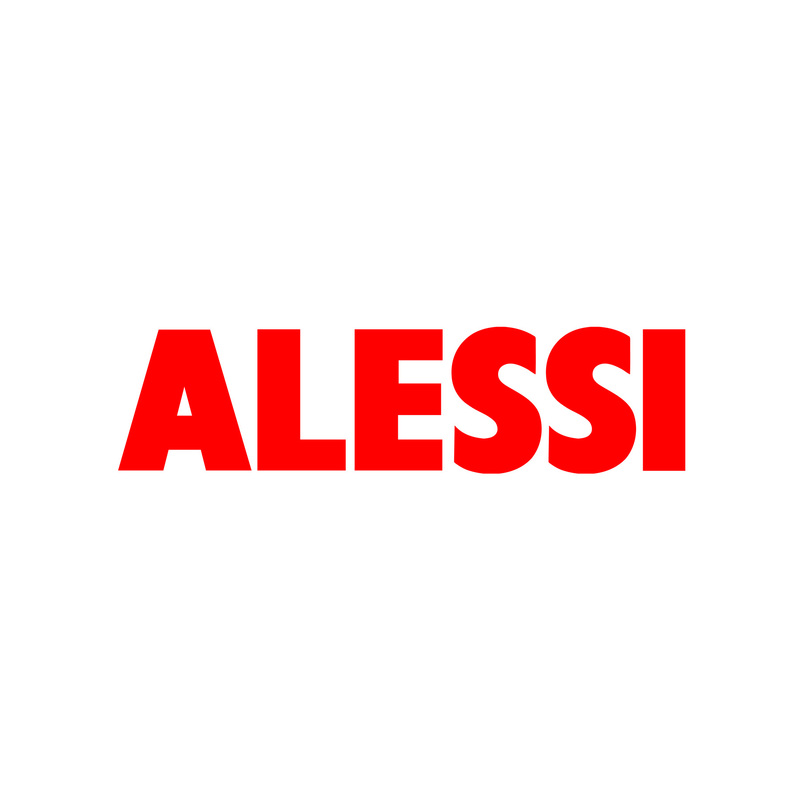 Drawings, alternative solutions, computer modelling, prototypes with 3d printing and their evaluation with the technical team of Alessi company. A lightweight cage built as a beehive to contain the honey, joined with a conical stem. One portion is around 8 grams of liquid honey. A new object for the honey with the most diffuse production as possible. The Acacia dipper is a project into the world of the honey, bees and mathematics. The idea was a flower to serve this food, obtained with a refined workmanship. I met examples of the natural minerals and of the architectures to compose a sphere with flat elements. The structure has been processed by 3D software, prototyped with 3D printing and produced with micro-casting technology. Acacia would keep the feeling to pick up an high quality food, widening its use as a mixer and a drop-proof spoon. Acacia Honey Dipper by Miriam Mirri is a Nominee in Bakeware, Tableware, Drinkware and Cookware Design Category. · Click here to register today inorder to be able to view the profile and other works by Miriam Mirri when results are announced. Acacia Honey Dipper by Miriam Mirri is Winner in Bakeware, Tableware, Drinkware and Cookware Design Category, 2015 - 2016. · Press Members: Login or Register to request an exclusive interview with Miriam Mirri. · Click here to register inorder to view the profile and other works by Miriam Mirri. Did you like Miriam Mirri's Kitchenware Design? Did you like Acacia Honey Dipper? Help us create a global awareness for good kitchenware design worldwide. Show your support for Miriam Mirri, the creator of great kitchenware design by gifting them a nomination ticket so that we could promote more of their great kitchenware designs.